I’m from Singapore and am currently a third-year medical student doing placements. In my spare time I enjoy travelling, as well as trying out new things – from experimenting with cooking to more adventurous activities like paragliding. I’m also a residential advisor at Logan Hall, helping look after fellow residents. The move from Singapore to Australia was scary at the beginning, but I received a lot of support from the Faculty and the international student societies. They organised events to bring international students together, which helped me with getting to know people. Why did you choose to study medicine at Monash University? 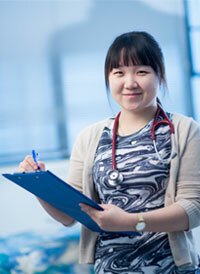 Monash offers a comprehensive and well-structured medicine course. The Faculty listens to the needs of the students and adjusts the curriculum to meet the ever-changing demands of medical practice. Tell us about your clinical placement experiences and what career pathway do you hope to pursue? I was placed under the Central Clinical group this year, so was at Cabrini hospital for clinical rotations and the Alfred for back-to-base teaching. We were given a chance to experience 12 different specialties, opening up many opportunities to learn from the best, as well as appreciate how different disciplines can come together to manage a patient. The wide variety of clinical specialities allowed me to understand the unique challenges and rewards of each. Prior to my oncology rotation I couldn’t understand how doctors dealt with diagnosing and treating cancers on a daily basis. Through my rotation I saw doctors treat the issue with delicate sensibility, ensuring their patients knew the team was with them every step of the way. I saw doctors make a real difference in their patients’ lives -- which is exactly what I want to be able to do. I really enjoy how Monash places the patient in the center of the goals of care. We’re taught to appreciate the patient’s perspective.